Balustrades are practical additions to staircases that are primarily intended for safety purposes; however, this doesn’t mean that they need to be dull and uninspiring. We have years of industry experience designing and installing balustrades; we can help you find the right balustrade style to accentuate the features of your property. We can create architectural balustrades using a range of different materials. We take into account your budget and personal style preferences and can provide you with the complete solution from consultation through to installation. To help provide a bit of inspiration below we have a brief description of some of the materials we like to use to bring the most out of your property. 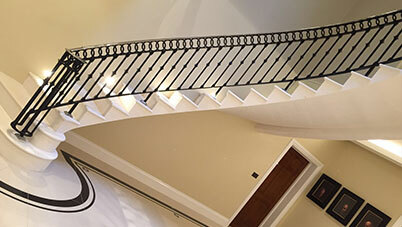 Brass Balustrades can be used to create a very distinctive classical, almost regal appearance. Ideal for use in pubs and hotels this balustrade style can also be adapted to accentuate domestic installations. If you like the look and feel of brass but do not want the material to dominate your interior design, we can also create balustrades that incorporate brass elements with other materials. Traditional Stainless Steel Balustrades often resemble a style akin to the turn of the century and art deco style designs. We can create many different stunning effects using stainless steel ranging from traditional to sleek, ultra-modern designs to suit any style of property. Glass Balustrades are visually stunning and work well with a lot of modern and minimalist interior design schemes. They are also great to help create an impression of space which works particularly well with open plan layout interior areas. 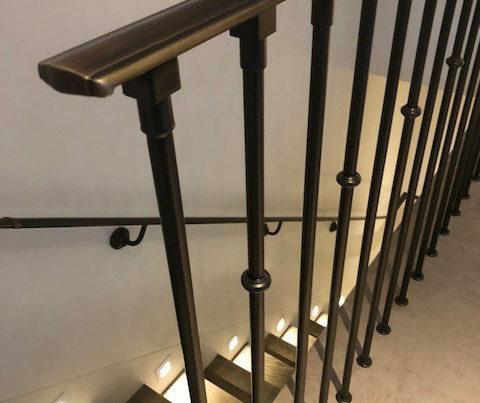 Somewhat similar to brass regarding appearance, Copper Balustrades can be used to create some different effects and can be reworked and redesigned for installation in almost any property. Also similar to brass, copper is an excellent hard wearing material that with regular maintenance can last for generations. We can create balustrades for indoor or outdoor use depending on your requirements. We take the time to ensure our balustrades for use outdoors are as hard wearing and aesthetically pleasing as their indoor counterparts. If you would like to find out more about our balustrade designs & installations, please Get in Touch to discuss your ideas and requirements. You can also view some of our completed projects in our Portfolio.